The images streaming in from the border of children being separated from their families have captured the nation’s hearts and minds. As a mother and grandmother, I feel deeply for the families who are being needlessly traumatized. More than 2,300 children have been separated from their parents by the administration’s “zero tolerance” policy. Cities throughout the country have felt the heavy impact of this policy, particularly Los Angeles. Recent reports say nearly 100 children separated from their parents at the border are right here in L.A. and most of them are detained. 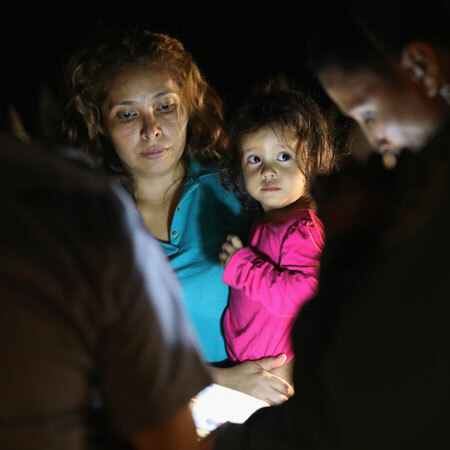 Separating children from their families causes irreparable harm, including anxiety, depression and post-traumatic stress disorder. What is happening at the border only magnifies the humanitarian crisis rippling everyday throughout the nation. Regardless of the President’s recent executive order, families are still being torn apart, and they are in dire need of services. Please join us in taking action to reunite and keep families together. The California Community Foundation believes that families belong together and has long been committed to empowering immigrants to integrate into the civic, social and economic life of Los Angeles. We launched the LA For All Fund to protect the rights and futures of these vital communities. All donations to the fund will go to organizations engaged in short- and long-term efforts to protect immigrant families affected by this crisis. These could include access to legal representation services for unaccompanied minors and assistance in reuniting families while providing critical social services, as well as advocacy, trainings and social services to better understand and stand up against the ongoing policy changes and attacks on our immigrant communities. We have also compiled a list of organizations working on the ground to protect and reunite families in communities across the country. This list will continue to be updated as more information and resources are available. ImmDef is a next-generation social justice law firm that defends immigrant communities against systemic injustices in the legal system. Founded in 2015, ImmDef has steadily grown to be the largest nonprofit provider of deportation defense in Southern California. ImmDef’s Children’s Representation Project is one of the largest programs of its kind in the United States and provides representation and pro bono placement (referrals for free representation by outside attorneys) for more than 500 children each year, including refugees, unaccompanied children and foster youth. KIND works to ensure that no refugee or immigrant child faces immigration court alone. KIND continues to build a robust national network of pro bono attorneys who have been trained by KIND and who have represented unaccompanied children in their search for safety, including children who have been persecuted in their home countries, trafficked to the U.S., and abused, abandoned or neglected. These are among the many protection needs of these uniquely vulnerable children. Established in 1986, Public Counsel’s Immigrants’ Rights Project (IRP) is one of the leading programs providing legal defense and advocating on behalf of Los Angeles’ immigrant community. For nearly a decade, IRP has conducted legal orientations for detained immigrants, provided legal consultations to those who lack representation, offered direct representation to immigrant detainees and match detained asylum seekers, victims of violence and long-time lawful permanent residents with pro bono attorneys. CARECEN is a non-profit, community-based organization with over 33 years of experience delivering quality, high-volume immigration legal services. CARECEN’s Unaccompanied Minors Representation Program provides legal representation services to unaccompanied minors and does active outreach to ensure these children are not alone when they face the immigration system. Al Otro Lado (AOL) was established in 2011 as an all-volunteer organization providing cross-border legal, medical and social service support to deportees, refugees and families separated by deportation. AOL has offices in Los Angeles and Tijuana, Mexico. The Los Angeles office is located in the LA Wellness Center at LAC+USC Hospital, where the organization provides immigration screening, referral and representation to low-income immigrants, with a focus on undocumented and uninsured individuals experiencing medical crisis. AOL actively collaborates with partners at the LA Wellness Center to provide holistic services (legal, social service, medical, mental health, etc.) to clients, and trains County medical staff and nonprofit partners on immigration law and benefits (namely health care) available to the low-income undocumented population. RAICES (Refugee and Immigrant Center for Education and Legal Services) is a 501(c)(3) nonprofit that promotes justice by providing free and low-cost legal services to underserved immigrant children, families and refugees in Central and South Texas. RAICES is the largest immigration nonprofit in Texas, with offices in Austin, Corpus Christi, Dallas, Fort Worth, Houston and San Antonio. When donating to organizations, consider marking your gift as general operating support. By doing so, you enable the organization to both respond to current emergencies and be prepared for those that may arise as a result of the ongoing and constant policy changes. Your help could mean the difference between a child who needs protection being sent back to his or her home country where the child’s life may be in danger – and the child being able to stay in the US. Most importantly, your help provides the child with access to legal representation and the opportunity to be reunited with their families.